Called “white gold” by some, platinum is one of the world’s most precious metals – and one of the scarcest. In fact, it takes about 10 tons of ore to produce just one once of pure platinum! Want another example? Platinum is so scarce that if all the platinum ever produced was poured into an Olympic-sized swimming pool it would only cover your ankles. All the gold ever produced would actually fill three such pools! While platinum is used for a host of practical and decorative purposes, it still maintains its status as a symbol of wealth. As such, it’s no surprise that this popular precious metal is a traded commodity in investment circles. 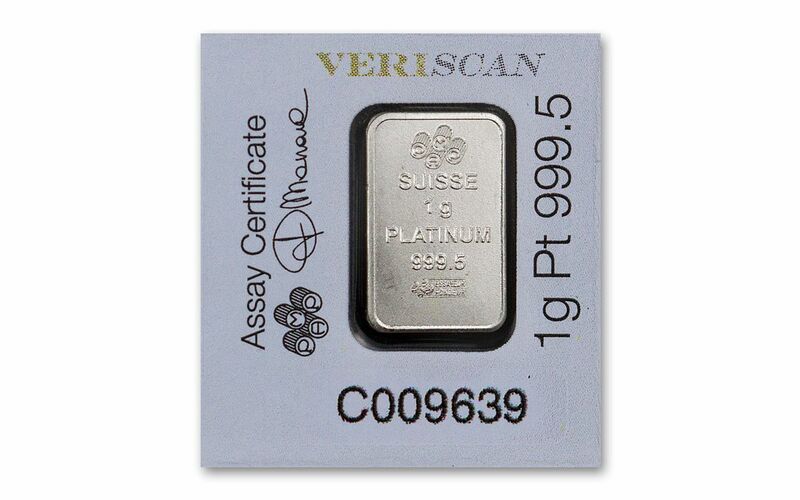 One of the best ways to acquire platinum is through these gleaming bars produced by the refineries at PAMP Suisse in Switzerland. 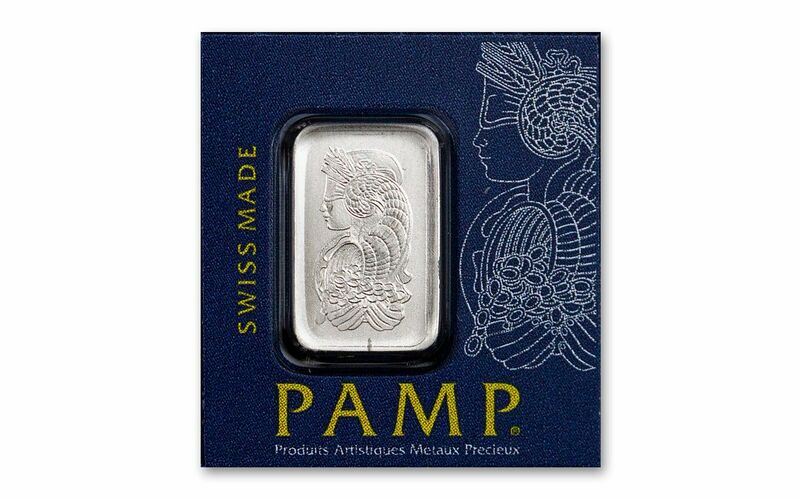 Considered to be among the finest platinum refineries in the world, PAMP Suisse is noted for the purity and quality of its products. Take this one-gram bar struck in 99.95% platinum, for example. Besides the significance of its pure platinum, it features an intricate design of Fortuna, the Roman goddess of fortune and fate. Fortuna’s role as the goddess of fortune is tied to her status as being the beloved daughter of Jupiter, the king of the gods. Together with her father, Fortuna was the bearer of good fortune at harvest time. She is depicted wearing a wreath crown and a cornucopia on her head with a blindfold over her eyes and her hands cupped at the bottom of the bar to catch the riches flowing from the horn of the cornucopia. These One-Gram Platinum Fortuna Bars are now available on a 25-piece sheet. Divisible into individual bars, the sheet is designed so that the bars can easily snap off. Picture a large chocolate bar that you can snap off bite-size pieces – only this candy bar is delicious for its precious metal content, which can be seen on the reverse side of each individual bar where notations have been engraved identifying the material as platinum along with the bar’s weight and purity. 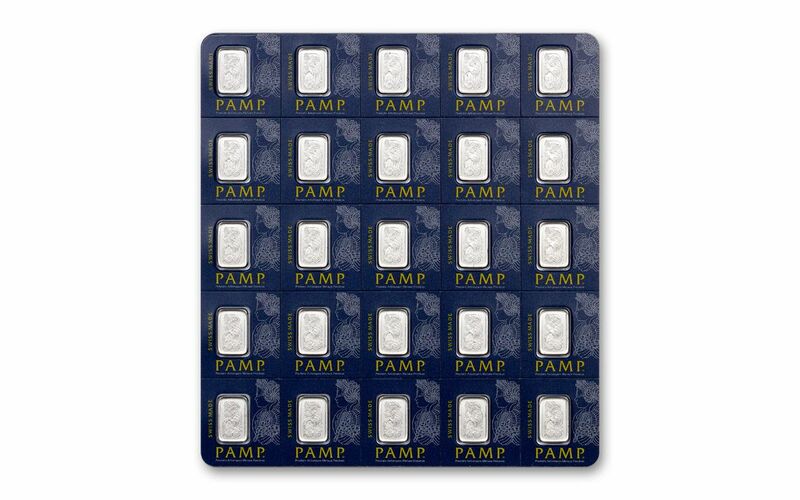 If you’re looking to add platinum to your portfolio or just enjoy having a unique numismatic treasure be part of your collection, then this PAMP Suisse Platinum Fortuna Bar 25-Piece Sheet is just the ticket! Click one to your cart today! A SYMBOL OF GOOD FORTUNE – The Roman goddess Fortuna is depicted on the obverse of these one-gram bars. As the goddess of good fortune and fate, it is only fitting she should be depicted on platinum, one of the world’s most precious metals – and one of the scarcest! STRUCK IN HIGHLY PURE PLATINUM – Each Platinum Fortuna Bar is struck in one gram of highly-pure 99.95% platinum. 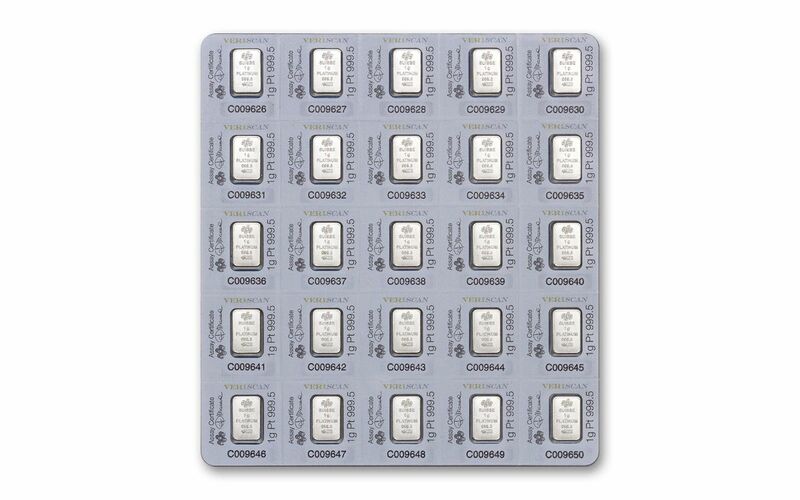 CONVENIENT 25-PIECE MUKTIGRAM SHEET – These Platinum Fortuna Bars come on a convenient 6 mm x 9.5 mm sheet that is designed so that each bar can easily be snapped off. MINT STATE FINISH – Your Platinum Fortuna Bar 25-Piece Sheet will come in original Mint State condition just as it left the refineries at PAMP Suisse in Switzerland. Let the goddess of good fortune smile on you by securing this PAMP Suisse Platinum Fortuna Bar 25-Piece Sheet. Order yours today!